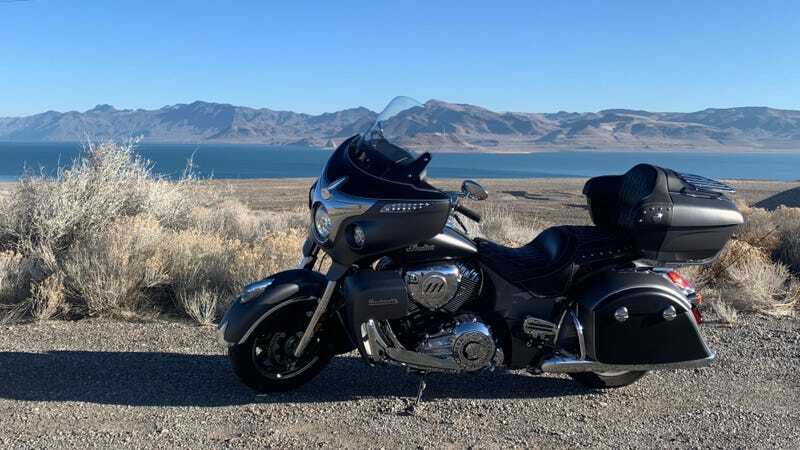 What Do You Want to Know About the 2019 Indian Roadmaster? The Indian Roadmaster is a full-dress touring bike introduced in 2015, powered by the same Thunder Stroke 111 49 degree V-twin that’s been in production since 2013. Next week I’m taking this huge cruiser on a 900-mile ride, so what do you want to know? My main trip with this thing will be from my place in Nevada to Portland, Ore. and back—on Indian’s invitation—to see the two-wheeled festival known as the One Moto Show. I’m hoping to get some pretty well-rounded impressions of this thing on the highway and around town. The engine gets its “111” name from the 111 cubic inches it displaces. That’s the equivalent of a 1.8-liter two-cylinder, and it makes 119 lb-ft of torque, which is nice because the bike weighs nearly 1,000 pounds—more with me in the saddle. It’s got a full fairing, three lockable trunks, Bluetooth connectivity, cruise control, navigation, heated grips and seats, and a power retractable windshield. New for 2019, it’s got fuel-saving rear-cylinder deactivation technology, too. It’s decked out to the nines, and is surprisingly comfortable. More on that in a review coming later. I’ll have the bike for at least a few weeks, so I’ll have plenty of opportunity to log some serious miles in the saddle. Let me know what questions you have about this two-wheeled car, and I’ll do my best to answer them.